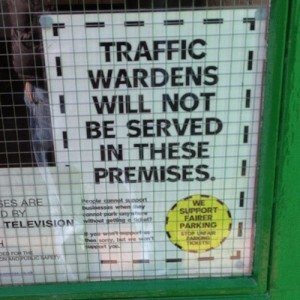 Can you imagine life without traffic wardens? Would your home town become a driver’s paradise in which everyone happily parked wherever they wanted to without fear? Would there be parking spaces for everyone and would passing motorists wave cheerily to you as you reverse out of an illegal space with a smile on your face? It seems not, at least according to the experience of the Welsh town of Aberystwyth. The Dyfed Powys Police force laid off its previous traffic wardens last year amid (presumably) scenes of rejoicing among the town’s motorists. However, the joy didn’t last long, as suddenly Aberystwyth’s drivers realised how important it is to have traffic wardens around. The town became clogged up with badly parked cars as the lack of parking control meant that people decided to park wherever they wanted to. In fact, things got so bad that it was declared the most difficult place in the UK to find a parking space, with queues of 35 minutes to get parked not uncommon. The local newspaper – Cambrian News – started a Street of Shame section which showed photos of vehicles which had been left illegally. Now, the return of traffic wardens over the bank holiday weekend has given a bit of unexpected relief to the local drivers. The council state that there will be 7 wardens working on their Civil Parking Enforcement section. They will be on duty every day of the week and will work during the evenings and bank holidays as well. Could Aberystwyth become the first place in the world where we see motorists thank traffic wardens for doing their job? If you want to see this unique sight then I suggest you get yourself off to the Welsh seaside town before people get used to them again and forget how bad life was without them around. This entry was posted in Musings, News and Views and tagged Cambrian News, car, Civil Parking Enforcement, LS, MoT, motorists, UK by Robert Bell. Bookmark the permalink.